An EU ban on Iranian crude imports in response to the country’s continued nuclear programme is imminent but not immediate or so the City analysts and government sources would have you believe. Furthermore, news agency Bloomberg adds that the planned embargo is likely to be delayed by up to six months as European governments scramble to seek alternative sources. The Japanese and Indian governments are also looking to reduce dependence on Iranian imports according to broadcasts from both countries while OPEC has indicated that it does not wish to be involved in row. Add the ongoing threats strike threats by Nigeria’s largest oil workers union, the Pengassan, as well the second largest, Nupeng, and political tension in the country to the Iranian situation and you don’t need the Oilholic to tell you that the short term risk premium is going mildly barmy. It is nearly the end of the week and both benchmarks have rebounded with City analysts forecasting short term bullishness. With everyone scrambling for alternative sources, pressure is rising on already tight supply conditions notes Sucden Financial analyst Jack Pollard. “With the near-term geopolitical risk premium being priced in, Brent’s backwardation looks fairly assured as the front spreads continue to widen. Well-bid Italian and Spanish auctions have no doubt supported risk appetite, as the US dollar tracks back to lend upward pressure on commodities,” he adds. When the Oilholic checked on Thursday, the Brent forward month futurex contract was resisting the US$110 per barrel level while WTI was resisting the US$99 level sandwiched between a bearish IEA report and geopolitical football. The next few weeks would surely be interesting. Away from crude pricing, to a few corporate stories, ratings agency Moody’s has affirmed LSE-listed Indian natural resources company Vedanta Resources Plc's Corporate Family Rating of Ba1 but has lowered the Senior Unsecured Bond Rating to Ba3 from Ba2. The outlook on both ratings is maintained at negative following the completion of the acquisition of a controlling stake in Cairn India, on December 8, 2011. Since announcing the move in August 2010, Vedanta has successfully negotiated the course of approvals, objections and amended production contract arrangements and now holds 38.5% of Cairn India directly, with a further 20% of the company held by Sesa Goa Ltd., Vedanta's 55.1%-owned subsidiary. Moody’s believes the acquisition of Cairn India should considerably enhance Vedanta's EBITDA, but the agency is concerned with the sharply higher debt burden placed on the Parent company. In order to lift its stake from 28.5% to 58.5%, Vedanta drew US$2.78 billion from its pre-arranged acquisition facilities. Coupled with the issue of US$1.65 billion of bonds in June 2011, debt at the Parent company level is now in excess of US$9 billion on a pro forma basis. This compares with a reported Parent equity of US$1 billion at FYE March 2011. Moving on, Venezuelan oil minister Rafael Ramírez said earlier this week that his country had decided to compensate ExxonMobil for up to US$250 million after President Hugo Chávez nationalised all resources in 2007. Earlier this month the International Chamber of Commerce in Paris, already stated that the country must pay Exxon Mobil a total of US$907 million, which after numerous reductions results in - well US$250 million. Elsewhere, law firm Herbert Smith has been advising HSBC Bank Plc and HSBC Bank (Egypt) on a US$50 million financing for the IPR group of companies, to refinance existing facilities and to finance the ongoing development of IPR's petroleum assets in Egypt – one of a limited number of financings in the project finance space in Egypt since the revolution. It follows four other recent financings for oil and gas assets in Egypt on which Herbert Smith has advised namely – Sea Dragon Energy, Pico Petroleum, Perenco Petroleum and TransGlobe Energy. On a closing note and sticking with law firms, McDermott Will & Emery has launched a new energy business blog – Energy Business Law – which according to a media communiqué will provide updates on energy law developments, and insights into the evolving regulatory, business, tax and legal issues affecting the US and international energy markets and how stakeholders might respond. The Oilholic applauds MWE for entering the energy blogosphere and hopes others in the legal community will follow suit to enliven the debate. Keep reading, keep it 'crude'! © Gaurav Sharma 2012. 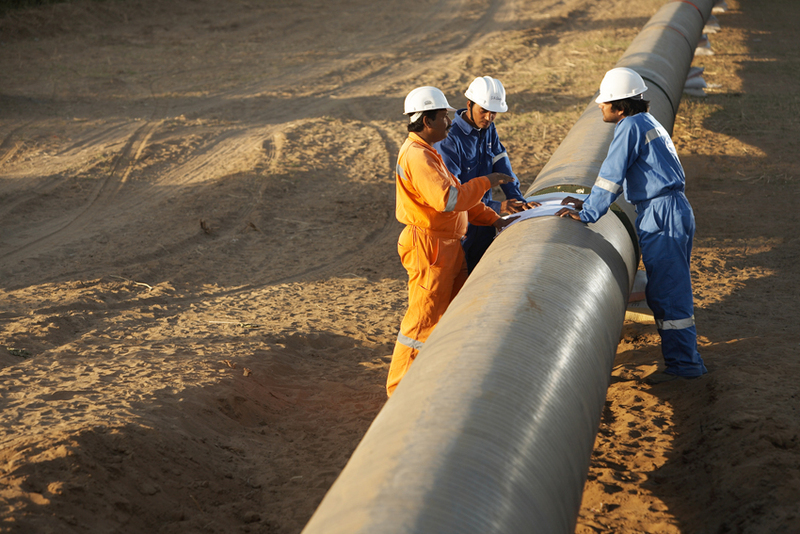 Photo: Pipeline, South Asia © Cairn Energy. Crude India & its ‘One Lakh ki Gaadi’!